The Orlando Sentinel published an article this morning about the launch (well, re-launch) of Orlando.com. Expedia owns the website, and the registrant is listed as Hotels.com in the Whois database. 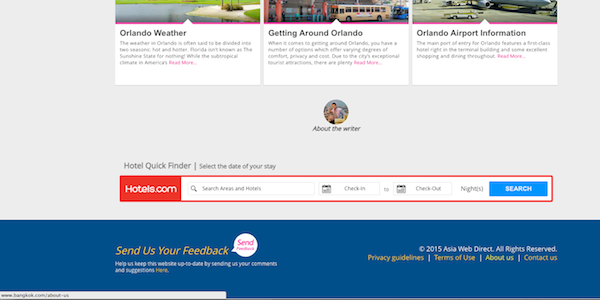 It looks like Hotels.com has owned Orlando.com for quite some time. DomainTools Whois History tool shows that Hotels.com was listed as the domain name registrant since at least 2003. In addition, Screenshots.com shows that there have been previous iterations of the Orlando.com website. I am not entirely sure how this new website differs from the old versions, but you could check out Archive.org to see what changes were made. One interesting thing I found was sort of by accident when looking at the footer. I saw the footer mentioned “ © 2015 Asia Web Direct.” I then clicked on the About Us link, and that took me to a similar looking website on Bangkok.com. I would guess that this is an error and the footer will be updated to reflect the Orlando.com website information. However, it was interesting to see that it looks like they are related to Bangkok.com in some manner (Whois records are different). If you are looking to travel to Orlando, you might want to check out Orlando.com. It looks like a comprehensive website, and it will be interesting to see if there are other websites that follow. I was happy to be the source and quoted for this article. I noticed the same thing in the footer. Did a quick search for Asia Web Direct and first result is for asiawebdirect.com which is a similar looking site to the first two you mentioned. Not sure whether this company precedes hotels.com or is a division. But it looks like hotels.com has been building geo based travel site network to promote their main brand. Very interesting.